While it also mentions our competitors, this review emphasizes the advantages that farm accounting software packages like TransAction Plus have over "main street" accounting programs. You'll also read advice from members of the "non-partisan" Farm Financial Standards Council. Thanks again to SF Business Editor, Dan Looker, for raising awareness of the importance of accounting as a core farm management function. Come on. You can't trust everything that comes out of a computer, nor can you rely on every magazine article that claims to have discovered a "dirt simple" method of cost accounting. Please jump back to the February FarmSmart article, "Cost of Production Calculation: Simple and Easy?" which links to a TopProducer article and join our rowdy discussion. Bob Swires, president of Swires Land and Management, Danville, IL was covered on the front page of the March 24, 2010 issue of Farm World. Swires made news as he disclosed trends at the Illinois Society of Professional Farm Managers and Rural Appraisers' 2010 Illinois Land Values Conference. In spite of evaporated demand for recreational tracts and 1031 exchanges, the farmland values in the Prairie State remain strong--exceeding $8,000 per acre in central Illinois--due mainly to local farmers expanding their operations. 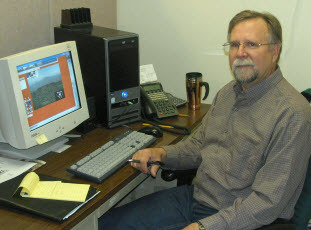 Swires uses the FBS Farm/Trust Manager software in his practice. Join us for these 1-hour free webinars beginning at 10:00 am CDT. To register, e-mail norm@fbssystems.com by 9:00 am CDT on the day of the webinar. As precision farming technology matures and becomes pervasive, innovators and FBS clients like Blake Hollis, Waterloo, Iowa, are walking away from their own RTK (real-time kinematic) towers and subscribing to commercial GPS-correctional signals according to the March 2010 issue of Prairie Farmer. Hollis has been strip-tilling for 12 years, has begun raising seed corn and is moving to 20-inch rows, all of which benefit from RTK. We see this cycle repeated each time a new innovation is introduced, perfected and mainstreamed in agriculture. Even IF the first-generation technology proves reliable (note a big "IF") innovators rarely receive a full return on their investments in money and time before the technology becomes obsolete. The early adopters who follow receive the best ROI (yet it's sometimes hard to distinguish an early adopter from an innovator when technology evolves so rapidly). After a technology is "mainstreamed," a "do-it-yourself" approach makes no economic sense, regardless of whether it's precision farming or farm financial records. Long-time FBS users will likely hear a familiar, friendly, voice next time they call into our office. That's right; Lonnie Newton is back as a company sales rep. Following an eight-year stretch serving FBS clients, Lonnie returned to Deere & Co, where he rounded off his career training assembly line employees on SAP software. We're excited to have Lonnie's experience and commitment to customers on-tap at FBS. You can reach him at 800.437.7638 /extension 106 or lonnie@fbssystems.com. Incidentally, farm shops create all kinds of accounting challenges ranging from asset tracking to inventory control to labor logging to cost allocations. We'd like to hear more on how our users manage their shops. Do you treat your shop as a cost center or profit center? What software do you use for maintenance records? Are you generating job tickets or using time cards? What metrics do you use to benchmark efficiency? Q. What is the best way to handle credit cards in FBS? 1. 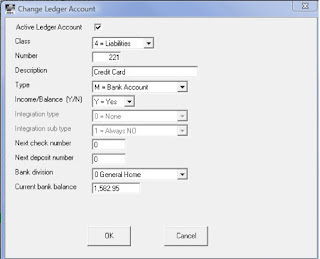 Define the account as Class 4 (Liability) and Type M (Bank Account). 2. Record expenses charged to the card through the Check input screen, using the credit card as the bank account and the retailer/business as the Vendor. Interest and fees can be expensed to the card in the same manner. Track unlimited credit cards (just set up a new liability account for each). Code expenses directly to the originating vendor and the appropriate expense account, center and division. Record (but not post) on-line payments from your conventional bank accounts. *The only limitation to this approach is that you can't print a check directly out of FBS; however, you can record the check number in the Entry Number field. Thanks to FBS Technical Services Manager, Sarah Dixon, for submitting this article.